1980 to 2015 from a technology perspective, advisors have gone from having essentially no technology choices to an extensive menu of solutions. What a difference 35 years makes. 1980 to 2015 — from a technology perspective, advisors have gone from having essentially no technology choices to an extensive menu of solutions. Some advisors would argue that the vast array of choices is too overwhelming. In order to make a full and fair assessment of the current technology landscape, it is beneficial to remember how far we have come. Therefore, in this 35th anniversary year for Investment Advisor, let’s take a walk down advisors’ Technology Memory Lane. First, the telephone. 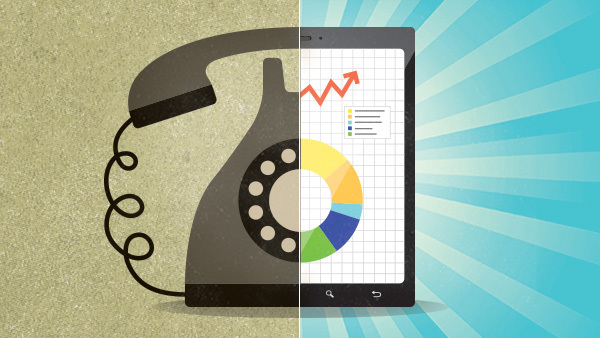 Yes, the technology offered through the telephone played a primary role in advisors’ daily business in the 1980s. Do you remember calling your custodian to check account balances, get real-time quotes and place trades? Anything you wanted to do involved picking up the phone. Remember, we’re talking about land lines here. Before we had touch-tone automation (the IVR technology), there were a few systems designed to recognize the clicks in a rotary phone. Cellular phones were available in the ‘80s, but they were cumbersome and expensive (not just for the phone but for the actual minutes used, too), so most of an advisor’s work was conducted at the office. Also, back in the 1980s everyone actually opened the confirmations and statements they received in the mail. These documents were critical for staying informed. Personal computers created a new technology world for advisors. Running on MS-DOS, the first versions of portfolio reporting systems were offered by companies that included Advent, Performance Technologies (known as Centerpiece) and FCSI (known as dbCAMs). Operating these programs was difficult at best, and it meant having someone on staff with special skills and an unflappable temperament. Importing data into those programs was another big challenge. Most of this work was done via manual data entry. The first data files slowly became readily available for advisors, but they needed a “cutting-edge” modem to download the files. In the early ‘90s, a new modem may have offered speeds of only 1,200 bits per second. Fortunately, the amount of data needed to run the program was minimal. You didn’t have storage for more anyway because the first hard drives offered typically had a capacity of only five to 10 megabytes. Today a broadband connection can download 50 MBs per second. As we moved into the 1990s, advisors began to embrace desktop technology. The first versions of Windows were gaining traction, but it was Windows 95 that achieved significant adoption, and it created a new world of desktop applications for advisors. Accessing account information and trade details, retrieving quotes and placing trades were the first features broadly available through a keyboard and a mouse. Email also became a critical part of advisors’ lives in the 1990s, which increased the growth of locally installed file servers. In the second half of the 1990s, the Internet was becoming the leading communication and information channel for both businesses and consumers. Advisors initially were not very excited about Internet-based platforms. Often advisors would say that they don’t want their private client data “on the Internet,” but of course it did not help that it was too slow. This changed as Microsoft and Netscape battled for the browser market, which ultimately improved the user experience, and broadband access became more widely available. This provided the foundation for new Web-based technology products and services. The days of locally installing multiple discs for new software and updates were beginning to fade. The speed of development and increasing number of choices has been a big part of the technology sector over the past five to 10 years. We have gone from the iPod to the Blackberry, iPhone, iPad and now smart watches. Mobile technology continues to have a big impact in helping advisors conduct their business and serve their clients. The new challenge is deciding when not to work. A lot has changed in the past 35 years, and I certainly didn’t cover everything. Some might argue it was simpler before all this technology. Maybe it was in some respects — but I wouldn’t return to it because then I wouldn’t have anything to write about!